Have you ever wanted a computer that you can leave on 24/7 and not even notice that it is on when you walk into the room? I know I have. Now I finally built one that is so quiet you can’t hear if it’s on or not even if you stand next to it. As a bonus, it is only the size of a large book, has a 1.6Ghz dual core atom processor, and idles at 19C (or whatever the room temperature happens to be). Check out the video to get an idea of how small and quite the computer is. Notice how it makes almost no noise when it’s on. If you walked into the room you wouldn’t be able to tell that there is a computer there too. 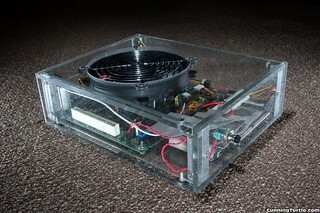 The dual core Atom motherboard used to have a small fan on it that cooled the graphics processor. That was removed and a 140mm Scythe fan was placed on top of the entire motherboard. Why such a ridiculously large fan? Because it’s quiet. Rate at 10dB, it is the quietest fan that I have found for sale and it happened to be 140mm big. So I worked with it, and it turned out to do an amazing job at cooling the whole computer. I was worried at first. While this big fan does move a lot of air, it moves it over a large area. The original 10mm fan sat directly on the chipset heat sink, providing localized cooling, which I was afraid the big fan might not match. I’m glad it worked out well in the end when I finally assembled everything and tried it out. 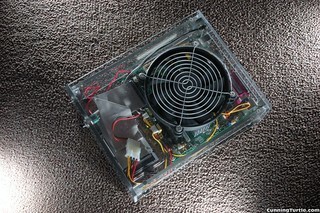 The 80 watt Pico power supply I used is over 95% efficient and produces almost no heat. The front of the computer has the power button. No USB ports or sd card readers. I was satisfied with just having 4 USB ports in the back. I used this computer as a media PC. I have a projector connected to it as well as a wireless mouse and keyboard. Really nice build there especially the case. Did make it or buy it? Loved the idea with the power supply, would appreciate to hear more since it’s probably the trickiest part in the system! I’m working on designing/building a case that is remarkably similar! I’m going to laser-cut it from bamboo and it will basically interlock together instead of using metal brackets. I’m curious, did you laser-cut the lexan? The cuts look very clean. Good work!